Kin-Ball is a recently invented game that comes from Quebec, Canada. Invented by Canadian university professor, Mario Demers, in 1986, it is a very distinctive game that is played by nearly 4 million people around the world. Unlike almost any other game on the planet, the game is not played in the traditional one-versus-one team or individual format, but it is played with three teams, all competing against each other to win at the same time. As a game, it is played across the world and is overseen by the International Kin-Ball Federation. Countries in which it is particularly popular are the USA, Canada, Malaysia, France, Denmark, Germany, Belgium, Spain, and Switzerland and is rising in popularity in other nations year-on-year. The game is regulated by the International Kin-Ball Sport Federation. The object of Kin-Ball is simple: to score more points than the two other opponents and win the game. Players do this by working as a team against the two other teams. 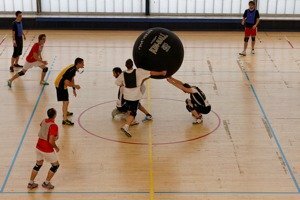 Because of the nature of Kin-Ball, a great deal of teamwork is involved, as is a good level of fitness due to the fast paced nature of the game. Kin-Ball is played in a gymnasium usually but it can also be played outdoors. The only required equipment to play the game is an official Kin-Ball, 48” in size with a weight of 2.2lbs. This can be in a range of colours such as grey, black, or pink. For an official game of Kin-Ball, an electric ball inflator is required too as is a scoreboard. Scoring in Kin-Ball is relatively simple. When a team faults, a point is awarded to the two other teams. A fault occurs when a team fails to catch and control the Kin-ball before it touches the ground. 1st Amount of First Places Won: If the teams have the same amount of first places. 2nd Amount of Second Places Won: If the teams have the same amount of second places. 3rd Amount of Fair-Play Ranking Points: If the teams have the same amount of points. 4th Amount of Ranking Points in the Game(s) where the Teams Played Against Each Other: If the teams have the same amount of ranking points in the games that they have played against each other. 5th Total Amount of Won Periods : If the teams have the same amount of won periods. 6th Amount of Periods Won by Each Team during the Games in which They Played One Against the Other: If teams have the same amount. 7th Total Amount of Lost Periods during Preliminaries: If the teams have the same amount of lost periods during preliminaries. 8th The IKBF will determine if it is appropriate to run a 5 points period or to play a complete game. It is highly unusual for a tie break game to need to go beyond the 3rd or 4th criteria. Games of Kin-Ball have three periods, each lasting 15-minutes, although this can reduce to 7-minutes for younger players. The game shall be played by thee opposing teams each consisting of four players. Between each period players will have a 1-minute break. The objective of the game is for any team when their colour is called to catch the ball with any part of their bodies before the ball touches the ground and then hit it back to another team. Play continues like this until a fault is committed by one team who fail to prevent the ball touching the ground and a point is awarded to the two other teams. When playing the ball, a team should have three players holding the ball, whilst the fourth player runs and strikes the ball after clearly shouting “Omnikin” and the colour of the team which will be required to run and catch the ball. Points can also be awarded to the two other teams if the striker of the ball mistakenly yells the colour of his/her own team. Shouting another team’s colour whilst simultaneously striking the ball. Letting the ball touch the walls of the game room without the naked team touching it. Hitting the ball twice in a row. Hitting the ball in a downwards direction. Taking more than 5 seconds to hit the ball after 3 players make contact. Hitting the ball less than 6 feet in distance. Hitting the ball when there are less than 3 players in contact with it. Purposely blocking an opposition player. The team with the most amount of points at the end of the game is declared the winner.